Fabulous way to make elegant dish out of plain ingredients. I’s crunchy, it’s delicious, and it’s a whole meal on one plate. 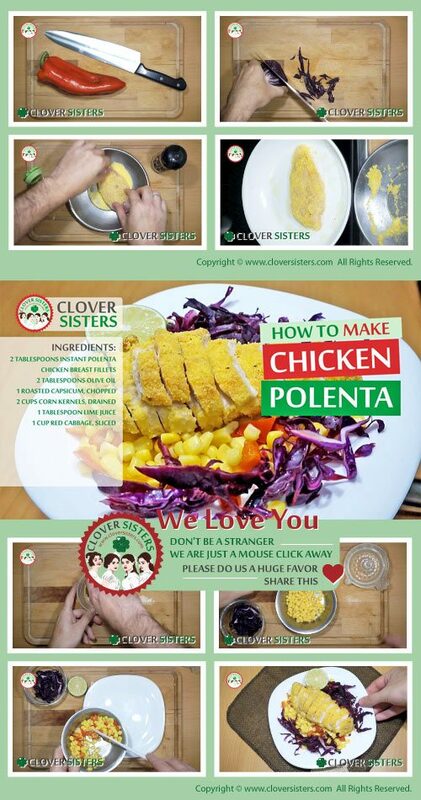 Chicken polenta can become favorite dish in your household. Season chicken breast with oil, salt and pepper. Spread polenta over the plate and press the meat and coat one side. On a non-stick pan, cook chicken with polenta side down to make it golden. Then place it on the baking tray, just this time turn polenta on the top. Bake for about 20 minutes in oven preheated to 400F (200C). While chicken is in the oven, prepare dressing from lime juice, olive oil, opt roasted almond. 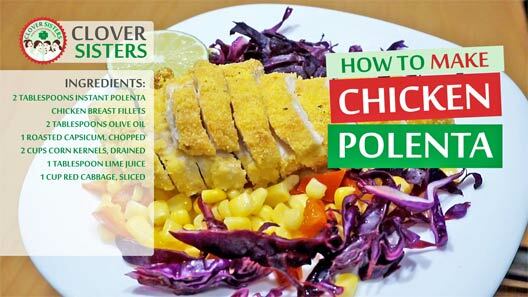 Arrange red cabbage, corn kernels and tomato, add chicken breast and add dressing.